Huda and the big trout! On our most recent two day smoking course we were delighted to welcome Dr Huda Al-Kateb from the University of the West of England Health and Life Sciences department. Her specialist subject? All sorts of food chemistry! She is a Council Member of the British Society of Flavourists and an expert in flavour and perfume analysis. As well as a chemist’s interest in smoking she had the enthusiast’s excitement in creating her own smoked foods here at Smoky Jo’s. Never before has a guest asked to put glass vials in our various smokers and collect samples of smoke and food! We look forward to hearing a little of what she learns about food smoking in a wardrobe…. 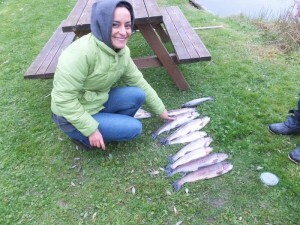 Huda also broke the record at Bessy Beck – although she left it late in the day she caught a two pound ten ounce rainbow trout – suitably brined and smoked on the following day! I post this as we await the arrival of guests for the last smoking course of 2013 at Shap… places are still available at The Wild Boar, though!